Raising a 150' guyed tower is a major endeavour. There really is no comparison to self-supporting towers half that height. It is far more than 2x the work! 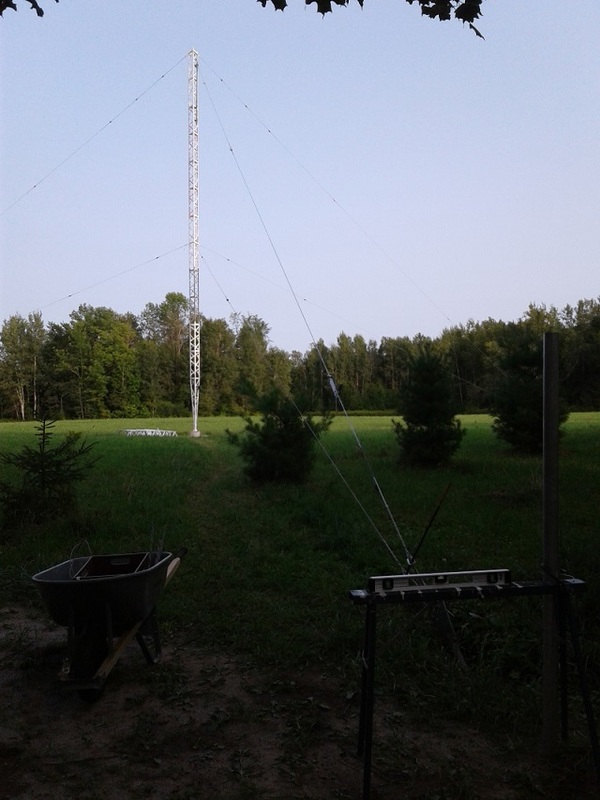 For the vast majority of hams big towers are nice to look at but you wouldn't want to own one. 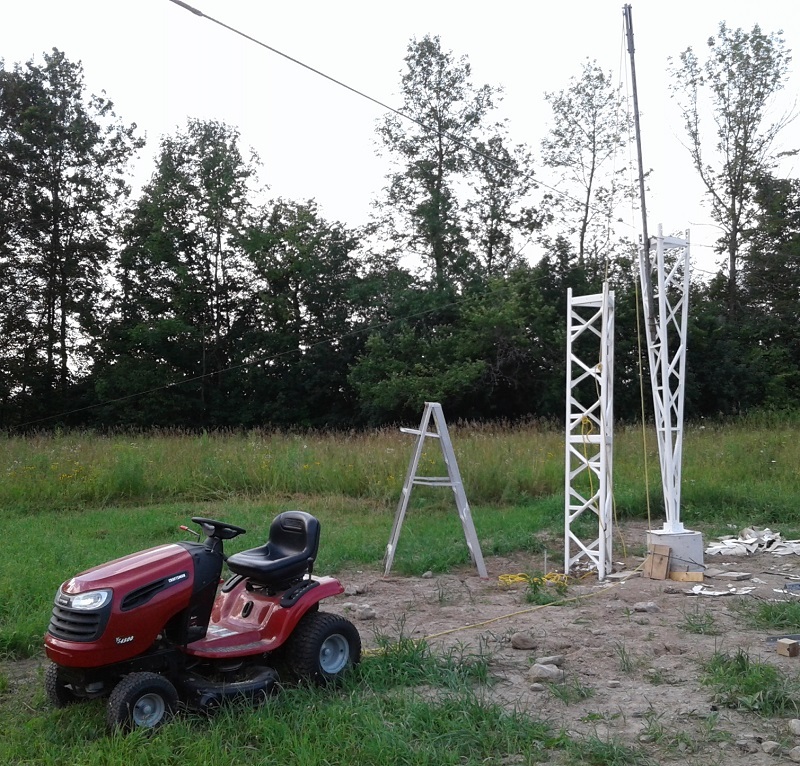 After all, not only is there the expense, difficulty and danger of raising it you must also maintain the tower and all the antennas and associated equipment that it supports. For myself I judge the effort worthwhile. Even so it is daunting. I've helped others put up and work on big towers, but that is no real comparison to owning one. The ground work is hard enough, and it only gets worse once you get up high. This article is a progress report. I'll describe much of what I had to go through just to reach this stage in the project. Things are moving along well enough despite the many questions that needed answering and the obstacles I had to overcome. Part 2 will cover the rest of the project to completion. Assemble on the ground enough tower sections to reach the first guy station, lift it and place it on the pin with a crane or lift truck, then attach the first set of guys. Manually lift the base section onto the pier, temporarily guy it, then lift sections until the first set of guys can be attached. I chose the second method. It is certainly cheaper and it provided an opportunity to test my newly designed and constructed gin pole comfortably close to the ground. Two strong men could place the base section by muscle alone but in my case it would mean calling in a favour to convince someone to drive out to my isolated location for 10 minutes work. I took the adjacent picture when the job was mostly done. You can see the basic elements involved. 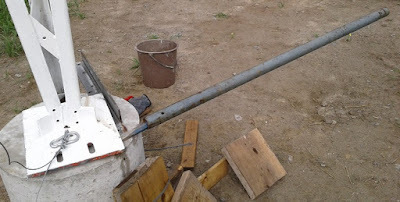 A standard section with my newly constructed gin pole attached was braced against the pillar. Guy ropes stabilize it. My trusty old hand 2 ton winch (come-a-long) provides the muscle to lift the base section (~150 lb). The two sections leaned towards each other when the base section left the ground. Rope stretches. It was all very stable despite the leaning. Lowering the base onto the pin took some sweat since I machined a very close tolerance for the 1" pier pin into the base plate hole. This is not at all necessary. I simply chose to stop when the existing hole was barely sufficiently enlarged since reaming a 1" hole in ⅝" steel plate with hand tools and a tiny drill-mounted grinder is not at all enjoyable. Eventually I got the base section sitting on the pillar. I removed the gin pole and the section on which it was mounted. I noted several gin pole deficiencies which I proceed to correct. The pin alone is sufficient to hold the base section in place until temporary guys are attached. Just don't try to climb it! The top of the base section was guyed with scraps of old steel cable I had lying around. Rope is not good enough since it stretches too much to be safe for lifting 3 sections onto the base section. The greater length of each temporary guy is ¼" EHS taken from an old tower. To this was attached ¼" aircraft cable to loop through the holes guy yokes holes at the top of the base section. At the anchor end I spliced on 3/16" aircraft cable to reach the turnbuckle and anchor plate. An abundance of clips and pre-forms holds it all together. The temporary guys were tensioned to between 400 and 500 lb. More would have stressed the cable clips and the smallest cables more than I felt was wise. 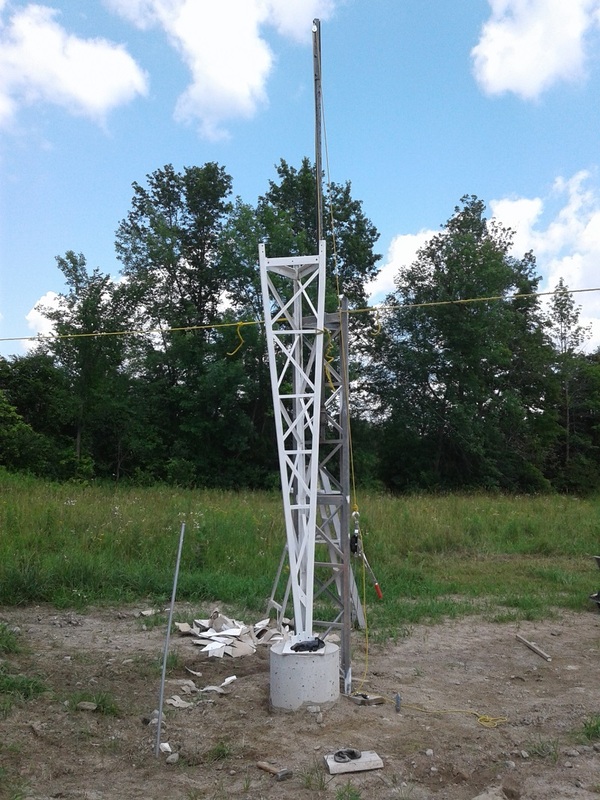 This tension worked well to keep the tower vertical and stable for lifting sections. Shaking the tower at the 40' level did induce some movement in the guys, which was expected and is not a safety concern. Notice the ladder. This became a regular fixture at the tower base since only on the higher rungs is there a sufficiently large opening for a boot (or two) to fit. This presented more of a challenge than I expected. A level doesn't work well since the legs aren't vertical and the horizontal members are not reliably horizontal. I used the common trick of placing a spacer at the bottom end of the level so that when place either on a leg face or vertex the level is vertical. The turnbuckles are adjusted (or clips moved) until all legs are at the same vertical angle. That took some fussing but was eventually done. Getting this right is very helpful to safely raise the section and then have the tower in good position to confidently set up the first set of permanent guys. At this point a potentially serious problem appeared. The bearing plate was neither horizontal nor flat. I checked and rechecked yet the error remained. I learned from the previous owner that the flaw was always there. He had a custom bearing plate made and welded to the base section and it was not properly done. He never experienced any problem despite the flaw. That may also explain why the bearing plate isn't flat. Consider that for my tower I calculate the pressure on the bearing plate due to tower and payload static load and the guy tension load to total close to 10,000 lb (4,500 kg). I next consulted by email with a ham having the requisite expertise (and who has several towers of the same type). He eased my mind on the scope of the problem but strongly recommended that I grout the base. I proceeded to do that. A bag of non-shrink grout designed for bearing plates is inexpensive, widely available and easy to use (it's a common building material). The job was straight forward since I have experience grouting landscaping stonework and doing concrete repairs. Lifting the base for grouting proved no great difficulty. 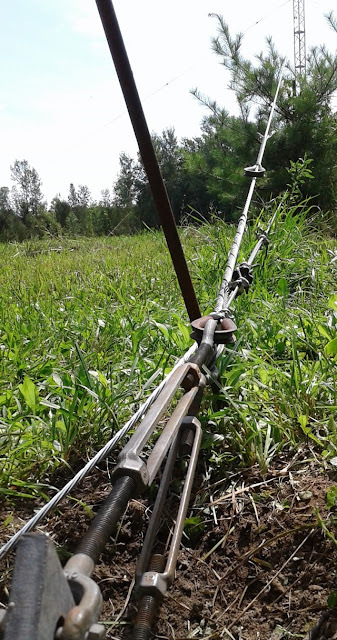 A large cold chisel was inserted into the gap and used as a pry bar aided by a pipe as a snipe. A conventional pry bar was tried but was not up to a lift of 500 lb, the sum of two sections and the downward force due to tension on the temporary guys. Scrap ¼" angle stock kept the bearing plate elevated for the grouting. The pillar was thoroughly wetted, swept clean and the semi-liquid grout mix shoved underneath with paint stir sticks. When the space was pretty well filled I used the pry bar to remove the angle stock and let the full weight fall on the grout. Because of the tight fitting pin I had to use a wood block and a small sledge hammer to pound the bearing plate down into place. The pressure would have filled most of all on any voids in the grout. The grout that squeezed out the sides was removed and the edge shaped to give it a professional look. When dry the grout provided a perfectly mated surface for the distorted bearing plate. Note that the grout bonds to the concrete but not the steel; the bearing plate can still tilt as it should. 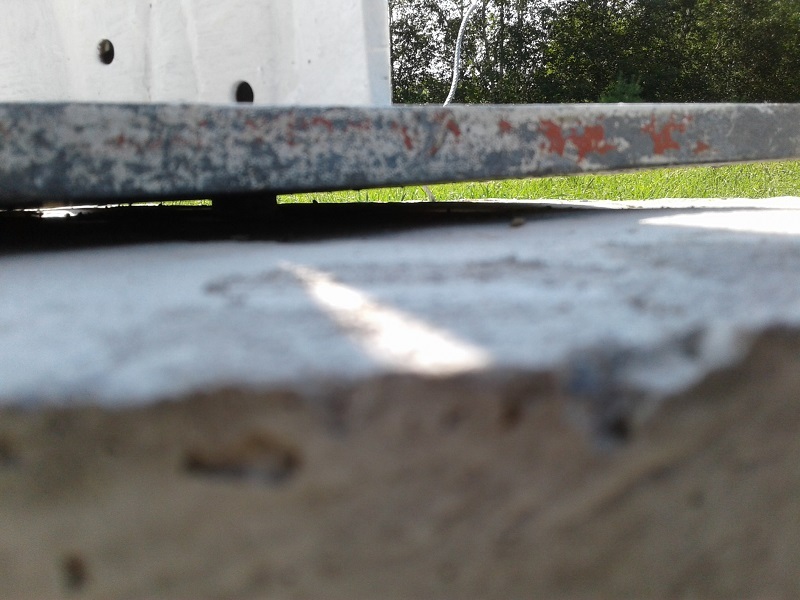 In fact we could tell when the tower wasn't perfectly vertical by a seam appearing between the grout and base plate. Since I can't weld I prefer fabricating devices from common metal stock and parts that can be found in hardware stores. It can be challenging at times. Devising a gin pole for the LR20 was just such a challenge. First I had to deal with 3 different styles of tower sections and small variations within the most common style of section. These were the base section, one section with curved members between legs and 13 sections with angle stock members. Despite the differences all sections meet the same splicing spec and fit together perfectly. The girts on all but one section have holes on the top surface for attaching support plates and other fittings. The positions of the diagonals was the greatest worry since this made the position of the lower attachment point variable. The base section also has non-vertical faces to be dealt with. In the picture at right the completed gin pole is at the 50' level, ready to lift the next section. Two stacked heavy duty construction L-brackets comprise the upper hook. 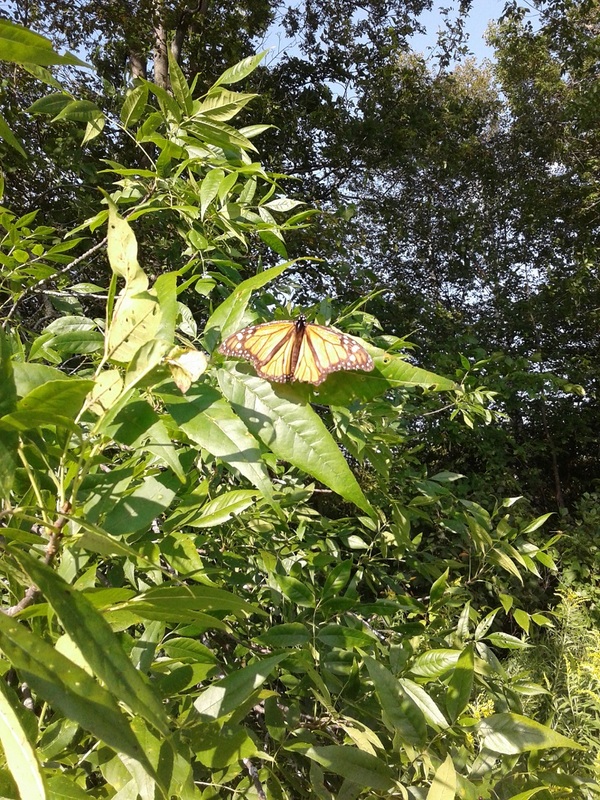 On the upper surface (not visible) is a short bolt that slips into a bolt hole on top of the girt (matching holes on the other sides of the girt are visible). A retaining nut is optional. For the lower attachment I took a short length of 2" schedule 40 pipe that slips over the 1.9" OD of the gin pole 1.5" pipe. A U-bolt and machined angle stock clamps the sleeve to a diagonal member. A short bolt at the center of the angle stock (not visible) increases the bearing surface by bracing against the inner surface of the diagonal. Two drilled and tapped holes in the sleeve lock the gin pole to the sleeve. To move the gin pole up one section the sleeve locking bolts are loosened. From the top the gin pole is lifted until the upper attachment is above the tower. The pole is lowered into the sleeve below (I made two to make this process safer). The bolt in the upper attachment is fit into the girt hole. Finally the sleeve locking bolts are tightened. The sleeve on the lower section is then removed, to be used later on the subsequent section. 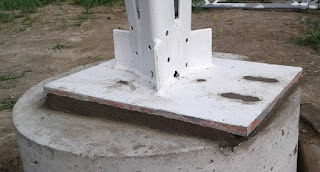 For the section without bolt holes on the upper surface of the girts the gin pole is rotated so that the long bolt that secures the L-brackets faces the tower. It fits into a bolt hole on the outer surface on the girt. The retaining bolt in this case is mandatory. The pulley must be moved to opposite side of the gin pole so that it is always facing the tower. 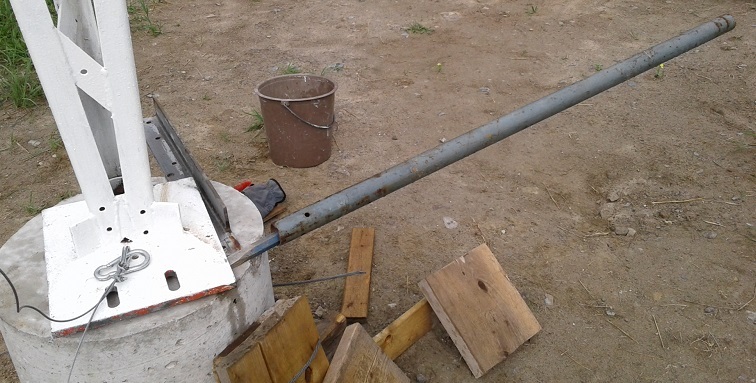 The gin pole was given a few improvements to correct shortcomings I discovered during use. It is lengthened 18" with a schedule 40 aluminum pipe, making it easier to lift 10' sections while not becoming too top-heavy for one person (me) to safely lift and position. Since the lifted section can easily snag on the gin pole bottom and protruding bolts I constructed ramps (shields) so that it can slide over these obstacles. The sleeve locking bolts are placed out of the way by rotating the sleeve so that they face inward. The shields successfully reduced the incidence of snags that inevitably occurred even with tag lines to pull the lifted section away from the tower and gin pole at critical moments during section lifts. My original intention was to use my lawn tractor to lift the sections. Unfortunately, as I feared, this didn't go well. The tractor is too light and the tire tread too smooth to gain enough traction to pull a free weight of 120 lb. There are solutions to these difficulties but that could not be quickly implemented. I resorted to the winch used to build the Trylon tower. It's a more tedious but proven method. I used junk box angle stock to construct pinch clamps to secure the winch to the base section and allow the handle to turn unencumbered just beyond the tower leg. The winch must be operated from a short ladder since I was unable to attach the winch lower where the base section is very narrow. The tower reached 70' with the winch. At that point I'd had enough with the painfully slow lift speed and tired arm muscles. My ground crew became restless as well since the slowness was boring. How I chose to resolve the problem will be covered in Part 2.
tension so a new pre-form is wound on the turnbuckle. The temporary guys are still attached for safety. Weight of 5/16" guy cable, strain insulators and pre-forms is considerable. For the first guy station at 35' I attached the guys to the tower section on the ground and lifted them as a unit. The trade off is that wrapping the pre-forms on the ground is easier than in the air but the lift is more work on the manual winch due to the additional weight. The gin pole is however up to the task. With more guy weight at the 70' and higher guy stations it is not practical to attach them on the ground. The guys were individually lifted and attached in the air. After the section with the guy station is attached to the tower the guys must be drawn out to the anchors in preparation for attachment and tensioning. This is a muscular job that must be done in stages to avoid undue bending stress on the tower. Before raising the guys I built them out to the lowest strain insulator. A single span runs from there to the anchor turnbuckle. Partially used and therefore lighter cable reels were carried into the field by wheelbarrow. The cable is attached to the strain insulator and unreeled back to the anchor. 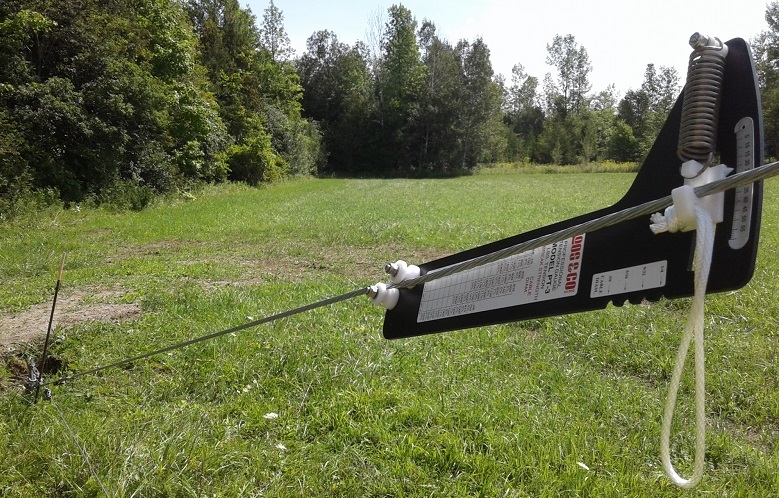 One person pulls moderately hard on the cable to get the rough distance and a second marks a point about 2 meters out from the turnbuckle. That's where I attached my cable grips for pulling the cable with the come-a-long. I use "sacrificial" pre-forms as my cable grips. They are far cheaper than the proper tool and work perfectly well. I call them sacrificial since pre-forms are not designed for reuse. I selected old stock 5/16" pre-forms from my junk box, using 3 on the guys and 3 on the turnbuckles. Only when near to full pre-load tension was reached did I use a new pre-form to attach the guy to the turnbuckle. Each guy was pulled part way with the come-a-long then tied off with a sacrificial pre-form. 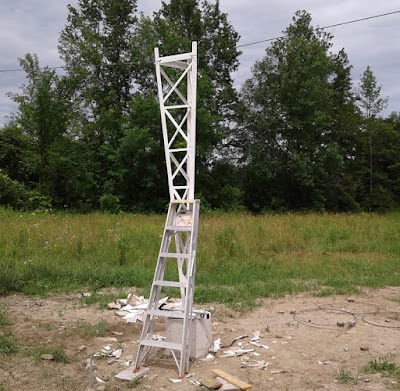 With just the one come-a-long it takes well over an hour to make the circuit of the anchors a few times until the tension was high enough and the tower adjusted to vertical that the permanent pre-forms could be attached. It wouldn't do to find that a final adjustment is beyond the range of the turnbuckles. Professionals use 3 sets of grips, tensiometers and come-a-longs plus one or more transits to do the job quickly and easily. A few of the sacrificial pre-forms had to be discarded during the tower raising when they fell victim to overuse. The tower must of course be made or kept straight and vertical as the guys are pulled to full pre-load tension. It is easy to have the tower lean or bend when there's 1,000 lb of tension on the guys. The professional tool to do this is a transit (theodolite). Unsurprisingly I don't own a transit and although I can rent one I also do not have the training to use one properly. Instead I used what I call my "poor man's transit". Although totally ridiculous it does surprisingly well if you use it carefully. My crew at the time, Brian VE3CRG (on the left) and Geoff VE3KID, show how it's done. A new aluminum tube (surplus but never used 2.5" aluminum tube) is the straight edge that is tilted to vertical with levels 90° apart (or one if you trust your arms to steady the tube). Do this standing near a guy anchor. You then sight along the tube towards one leg of the tower. Deviation from vertical can be estimated from the width of a tower leg, as sighted at the guy station on the tower. Later I attached the tube to a fixture so that it didn't need to be held in place during use. multitude of ticks and biting insects in the wet hay field. To correct deviations from vertical the opposite two guys are adjusted the same amount in opposite directions. That is, if you loosen one turnbuckle 3 full turns the other is tightened 3 full turns. Done this way the tower will move in the desired direction without changing the guy tension. You can calculate the number of turns per the turnbuckle thread pitch (keep in mind there are two screws, not one, so the rate of change is double the thread pitch) or guess and then correct your guess after rechecking with the transit. You must repeat the process with the transit at the other two anchors. It doesn't have to take long if you go about it methodically and don't rush. Let me interrupt here to warn you about shortcuts and to bust a common myth. Do not use a level on the tower itself to test for vertical. It doesn't work. Although the splice tabs at either end are usually exactly where they ought to be the tower members in between may not be. Welding, shipping, previous usage and abuse can add deviation and ripple that will fool a level. Move it from place to place on a seemingly straight section and you'll see. Small deviations can trick you. 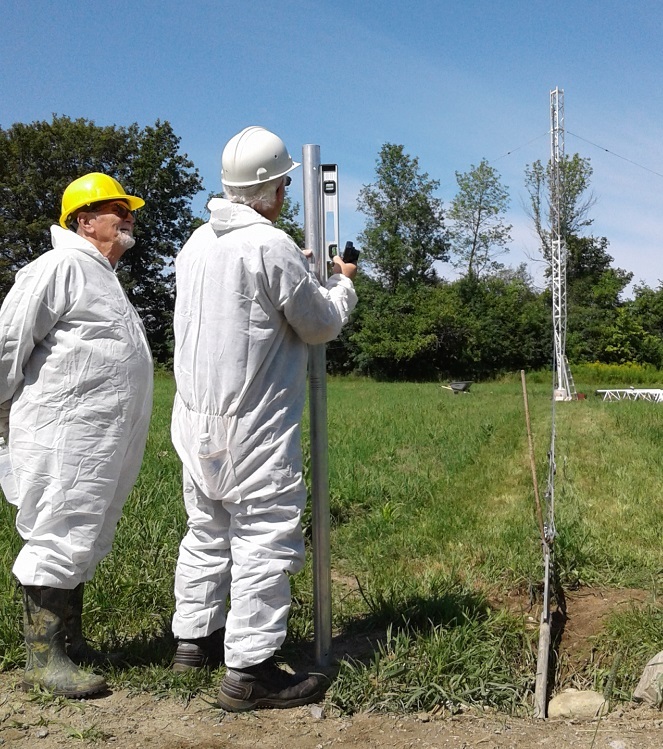 Even if the tower steel is perfectly straight the level itself is often not adequately calibrated. Use each side in turn and if they do not agree the level is not calibrated. A perfectly calibrated level is still inadequate since the tower is many times longer than the level and an imperceptible deviation will be greatly amplified. The myth is that a guyed tower or mast is vertical when the tension in the guys is equal. A tower can lean quite a bit out of vertical before any measurable amount of tension differences among the guys appears. This is because the guy tension is far greater than the horizontal force of a leaning tower. In fact if you tighten one guy you'll find the tension in all the guys increases the same amount. Tension differences are often due to incorrect use of the tensiometer when attached to the cable. A persistent 100 lb difference in one guy was corrected by reducing the tension in the temporary guys. This discrepancy is in general a sign that guys at multiple levels are either not properly adjusted or there may be a flaw in a tower section or a section splice is misaligned. Another source of error is the lay of the guy strand. With only 7 strands in EHS each is quite large gauge. Move the tensiometer a short distance along the guy and remeasure. A high or low point on the EHS where it contacts the tensiometer can affect the reading. That small amount of cable deflection difference on 5/16" EHS can be 50 to 200 lb in my experience. I'll end Part 1 at 70' where the second guy station is located. This is almost halfway. The tower is vertical (using my "improved" poor man's transit), the guys are tensioned and the temporary guys are gone. The next sections to go are parked alongside the base. Although the Trylon tower is only a foot or so taller I am still looking up at it from the 70' level of the LR20. The Trylon sits on the higher grading surrounding the house. The hay field undulates, with high and low points, and a general downward slope toward the swamp behind the tree line. Terrain matters when it comes to height. The top half of the tower has challenges unlike the lower half and will require changes in technique and equipment. For example I am retiring the winch since it is too slow and difficult for the longer lifts. I'll discuss this and more in Part 2. I'll close with a picture I took at the edge of the hay field while taking a break from working on the first set of guys. It is always refreshing to occasionally take in the scenery. Putting up a big tower is a lot of work so frequent breaks are mandatory. Fatigue causes accidents. Stop when you no longer feel 100%. "Bring me milkweed or I start a tornado to blow down your tower!"